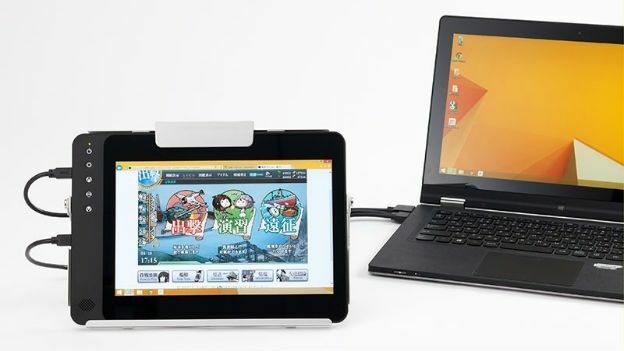 Taiwanese company GeChic is responsible for a number of interesting portable monitors, including last year's GeChic On-Lap 2501M which featured its own built-in battery. This year, the company has launched a new monitor in the form of the GeChic On-Lap 1002 that boasts a touchscreen as its headline feature. The thinking behind it is an obvious one - with many PC users switching to touch due to Windows 8, the requirement is that a second monitor is equally finger friendly. The range of connection ports bolted onto the side of the On-Lap 1002 means it's not simply meant as an attachment to your PC, but as a second screen for all kinds of mobile devices: tablets, smartphones or games consoles. While GeChic does manufacture 15.6-inch external monitors, the model the company sent us for review was the smaller 10.1-inch version. We put it to the test to see if it's worth a couple of hundred pounds of your hard-earned cash. At 10.1-inches, the GeChic On-Lap 1002 is the same size as your average tablet. It is, however, thicker than an iPad Air or Samsung Galaxy Tab S at 10mm thick. And, unlike the tablets of today, it also boasts a pretty chunky bezel - but that's in order to fit in the touch-sensitive controls on the left hand side of the screen. These allow you to switch the input and dial up the volume or the brightness. Yep, we said volume - the On-Lap 1002 features a built-in speaker so you can use it with a PS4 for example, without having to resort to headphones. Build quality is pretty solid and, providing you didn't hit the screen, this monitor could stand a knock or two. The design is a black, brushed metal affair; however, it also comes with a silver aluminium protective cover that doubles as a stand. Along the left hand side is where you'll find all the connection ports, including Micro HDMI, Micro VGA and two microUSB connections - the first operates for both USB touch output and power supply while the second is used only for power when you need an independent power source, but don't want it from the USB port from your PC. All told, it's a pretty standard-looking monitor that, at 505g, isn't break-your-back heavy, but is some way from the light Android and iOS tablets we've become used to. Along with adding 10-point multi-touch, GeChic has improved the resolution this time around. The GeChic 1002 boasts a 1,280 x 800 resolution with an 800:1 contrast. The IPS panel has a 170-degree viewing angle and a reflective TFT coating that, while not much use in strong daylight, does offer up good colour contrast. Unfortunately, with one feature added, so another is taken away. The On-Lap 1002 doesn't feature a built-in battery and will need to be powered in addition to whatever is connected to it. This was a standout feature of last year's On-Lap 2501M and the lack of inclusion here counts against the On-Lap 1002 when it comes to portability. The aforementioned built-in speaker can be found on the bottom of the right-hand side underneath the screen controls. At 1W, it's not particularly powerful and the audio is decidedly tinny. However, there is a 3.5mm headphone jack added to the display to take advantage of. We mentioned the connections earlier and one of the benefits of the On-Lap 1002 is there's very little that you can't attach to it. While Apple devices will work with the monitor, GeChic doesn't provide any Apple-compatible cables in the box, so you'll need to use your own. The On-Lap 1002 utilises an auto-source scanner to pick up the input automatically from whatever is connected to it. This worked well when we tried it and the monitor picked up the input in a matter of seconds. That's a good thing because the touch-sensitive buttons on the left hand side take some time to get used to - and aren't the most responsive we've ever felt. But because of the auto-scan, it's unlikely you'll have to use them often. We didn't have any problems with the touch screen. Although, because of the reflective coating, you'll find plenty of smudgy fingerprints after use. And the display itself boasts an impressive colour contrast that lends itself well to media and playing games. What lets the On-Lap 1002 down in our opinion is the choice of screen size. At 10.1-inches, it's the size of a tablet and, as such, doesn't offer the same kind of screen real estate as a 15.6-inch standard monitor. If you need more space for sharing a movie or working on documents then chances are that 10.1-inches isn't going to cut it for you. The GeChic On-Lap 2001 is a well-constructed little portable monitor that could be very useful for frequent travellers or students with small rooms that limit furniture. The picture quality on the device is good and, if you've got it attached to a Windows 8 PC, the touchscreen capability really comes in handy. However, there are two points that limit this screen's appeal: The lack of a built-in battery and the screen size itself. It's unlikely that PC users will want a second screen that's only 10.1-inches in size. Or that gamers will want to plug an Xbox One or PS4 into such a small screen. And, if you don't plan on using it with a PC, it would probably make more sense just to buy a 10.1-inch tablet instead. While we can't fault the ability of the device - it does exactly what it says on the tin - we're having a hard time understanding why people might purchase it over a tablet or a larger external monitor such GeChic's On-Lap 1502I 15.6-inch. It comes down to the touchscreen and if you value that as a feature in a second screen. If so, the On-Lap 1002 is a good choice, but otherwise we'd steer clear.